As silk weavers, goldsmiths, clock and watch makers, opticians, bankers, gilders, ironworkers and horticulturists the Huguenots made an extraordinary contribution to English craftsmanship. Names such as Paul de Lamerie, Courtauld, Tijou, Dollond spring to mind. In virtually all areas, the Huguenots were way ahead of the English.. 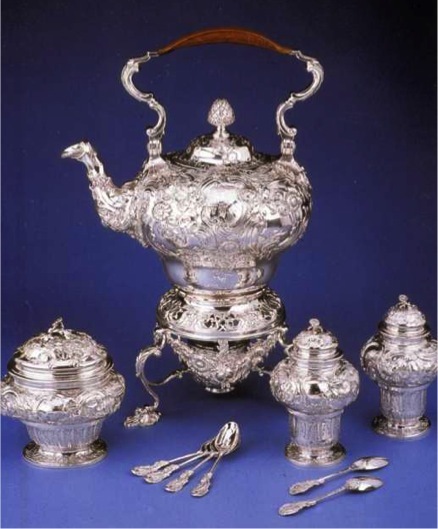 The elegance and luxury of their tea services very much inspired the whole social niceties and etiquette of afternoon tea. Welcomed at first with open arms and bringing luxury skills, the Huguenots’ fortunes fluctuated wildly. 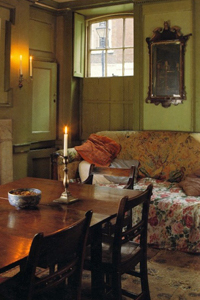 I talk about their early 18th-century houses that still stand, how they were decorated and lived in; I discuss the fashionable patterned silk dresses – who designed and made them. And how, finally the trade died out, with some weavers literally dying in poverty at their looms. One of the weavers’ houses can still be visited today. 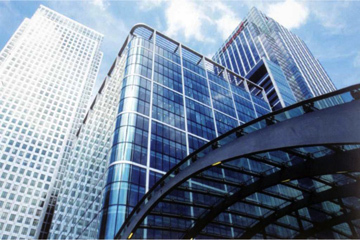 Over the last 25 years, the Docklands area of London has been transformed. Here are not only some of the great Georgian industrial warehouses and dock buildings, but state-of-the-art office buildings by the great architects of today. Canary Wharf is also a dramatic and witty sculpture park. This talk looks at the transformation of the area and examines the architecture in detail. 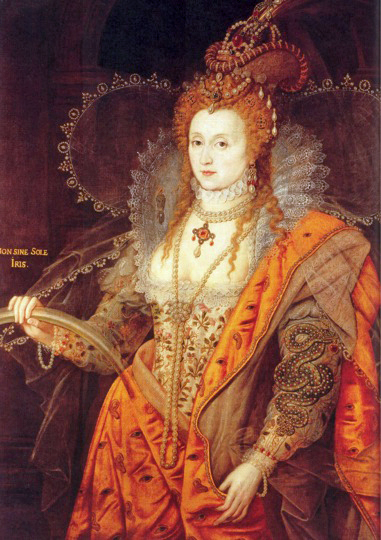 As Elizabeth aged, and it became clear she would neither marry nor have a direct heir, her position became extremely precarious. Her image was increasingly controlled, becoming a tool of propaganda, particularly through the use of symbols to suggest purity, self-sacrifice, youthfulness and indeed immortality. 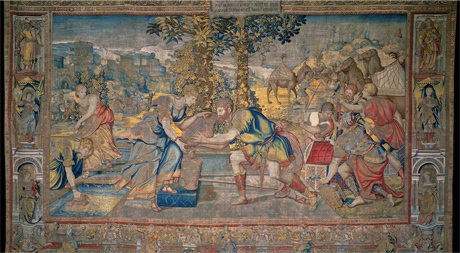 Some of the most sumptuous tapestries of 16C & commissioned by Henry VIII himself, each tapestry contains a vast amount of silk and gilt and reflected the Magnificence that was central to the Renaissance concept of royal display. This talk examines why and how they were made. Beyond the roll-call of saints and their attributes familiar to us all, there is a wealth of others whose lives were eccentric to say the least. Mediaeval artists had a wonderful time depicting their symbols in a variety of ways – St Lucy with her plates of eyes, St Agatha with plate-loads of breasts; St Wilgefortis with her beard to protect her from unwanted seduction, to name but a few…. This is a series of lectures which explore the development of London from when it was first settled by the Romans two thousand years ago to the present day. The lectures are an hour long but can be expanded up to two and half hours if required. The emphasis can be adjusted to suit your society’s or organisations’s requirements, e.g. the focus could be on historical events, architecture, culture or a mixture. The chosen illlustrations will be of buildings/artefacts that still stand and can be seen, wherever possible. And of course the nature of the lecture(s) will be adjusted to take into account the prior level of knowledge of the group. Enjoying a relatively brief existence, the tapestry manufactory was set up in 1619 by James I and supported by the patronage of Charles I. In its heyday, lavish sums were spent on Mortlake’s luxury products with patrons such as George Villiers, Duke of Buckingham. Its most famous set of tapestries was woven from Raphael’s cartoons for the Acts of the Apostles, but this lecture will examine whether Mortlake planned its own head designer in the person of Van Dyck. These are lectures that I give to organisations such as NADFAS (National Association of Decorative and Fine Arts Societies), the National Trust, U3A and other historical and arts societies. For NADFAS societies, please book through your Programme Secretary, otherwise for further information please contact me direct. I lead a number of walks, visits and special tours that complement my lectures and talks. Please contact me direct to discuss your needs.